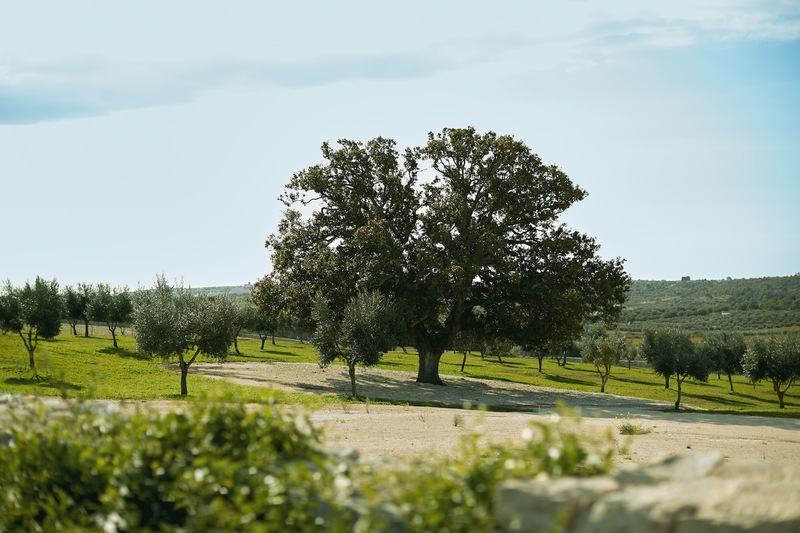 The Garden of Mediterranean Fragrances frames Masseria Grieco which, embellished by its characteristic Mediterranean architecture, stands like an elegant work of art overlooking 10 hectares of woods. Masseria Grieco is a haven of tranquillity set in the heart of the Apulian countryside, a perfect place for regenerating oneself. Made of local stone, the Country Resort stands out for its distinguishing combination of ancient rustic tradition and a history of elegant hospitality. The infinity pool, with a panoramic view of the Itria Valley, seems to have been traced out directly on the skyline. This is an ideal location to keep everyday stress away while being pampered by the warmth of the sun, in the green heart of Apulia. 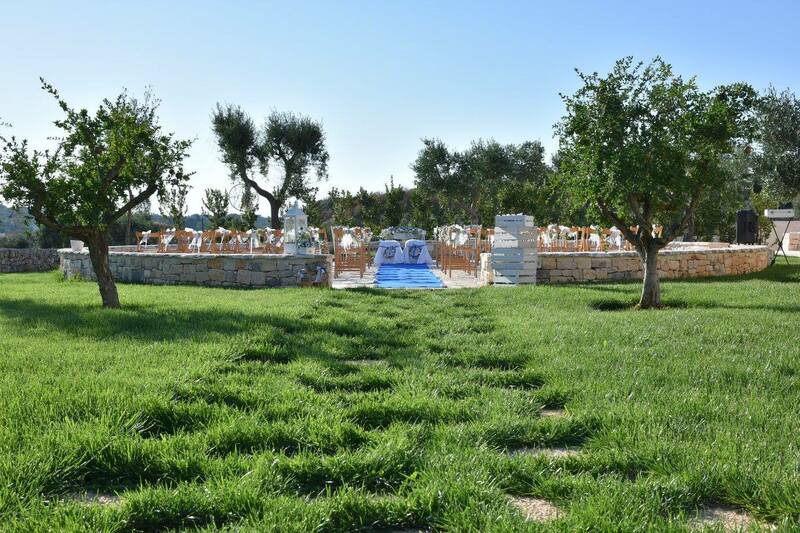 All events deserve to be celebrated, that is why Masseria Grieco offers a unique location for Weddings, Baptisms, and First Communions, as well as any other important event to be remembered. from the airports of Bari and Brindisi. where you can spend relaxing moments. 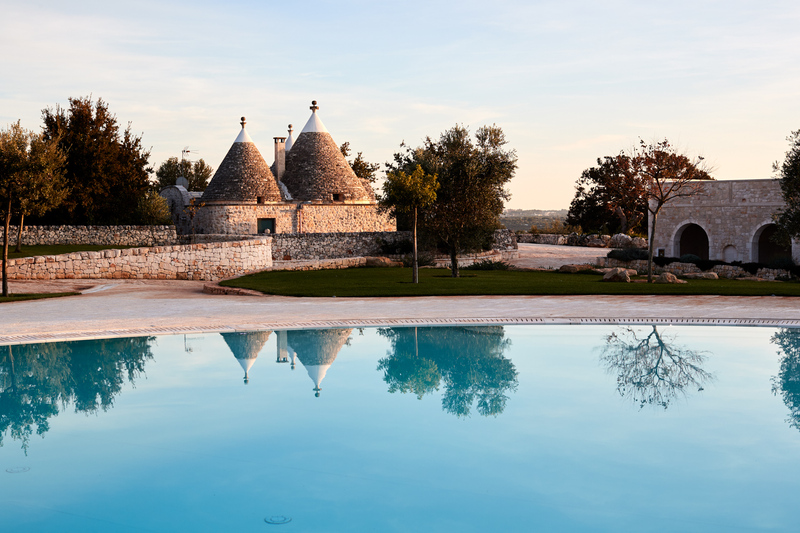 Within the rural environment of the Masseria Grieco Country Resort hospitality enhances the identity and uniqueness of the Itria Valley. The recovery of authentic details, combined with the natural design of the interior furnishings, offers a stay experience embellished with the charm of the natural Apulian stone [known as Pietra Viva, a sort of limestone, as white as marble but as hard as flint]. 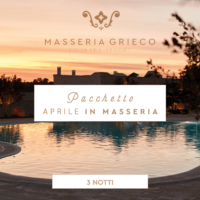 Lit by the warm sun of Apulia, the infinity pool of Masseria Grieco is the real protagonist of the summer evenings, looking like a smooth mirror that seems to get lost and blend with the charming surrounding countryside. Between Ostuni and Cisternino you find yourself in the charming countryside of Contrada Grieco, not far from the sea and from the main tourist destinations of Apulia. Discover the nearest destinations and enjoy every moment of your holiday in the Itria Valley! The Reception Hall and the external square on the front side of the original body of the building can accommodate up to 160 people. Each event can be tailored to your needs in agreement with the staff, who are at your disposal to offer advice on any aspect of hospitality and meet customer needs. The Country Resort is a corner of the Apulian countryside immersed in the tranquillity of the Itria Valley. Walking through the farm, scented by the simple fragrances of its garden, you can find rose-bushes, oak trees, pomegranates and plenty of unmistakable fragrances such as lemongrass. 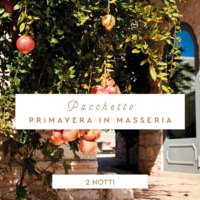 Masseria Grieco brings along a wealth of details that belong to the rural history of the Itria Valley. 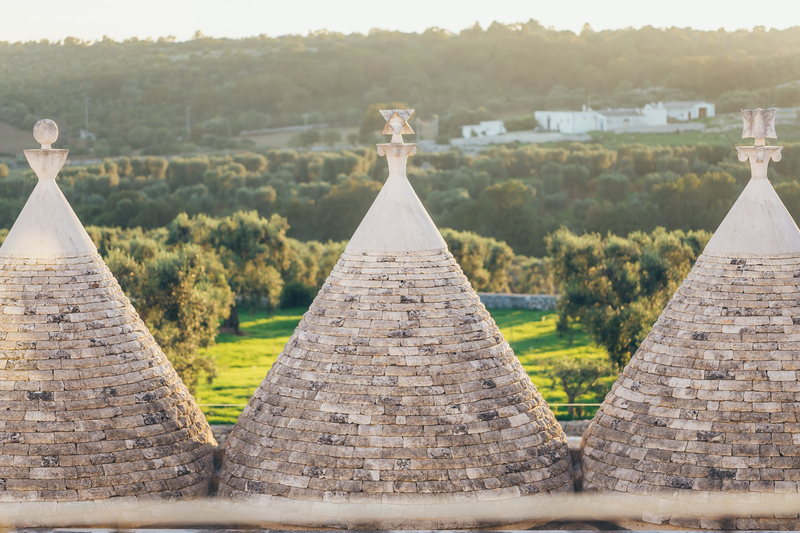 From the square, entirely made of local stone, running through the trulli and the cummerse, winds the story of the ancient everyday life of the Apulian families. Masseria Grieco invites you to discover the news and promotions dedicated to those who wish to live a relaxing experience. Subscribe to the newsletter and you will receive the latest news from our Country Resort. Pursuant to Legislative Decree 101/2018 (Adaptation to EU Reg. 679/2016) and art. 13 and 14 of EU Regulation 679/2016 (GDPR), in relation to common personal data, identifying, sensitive and / or judicial (including employees, suppliers, customers and third parties generally in your availability) of which LEGAL REPRESENTATIVE PRO TEMPORE of MASSERIA GRIECO Srl, in the person of its owner and legal representative pro-tempore, (Data Controller) based in OSTUNI (BR) - Contrada Grieco, P.Iva 02480530746, will come into possession, we provide the following information. The data provided will be processed for: a) purposes related to the correct and complete execution of the order and / or signed contract (for this purpose the consent is not necessary as the processing of data is related to the execution of the order and / or contract signed, b) for purposes related to the exercise of the rights of the owner (eg defense in court); c) for purposes related to the fulfillment of obligations under the provisions of law or regulation as well as for compliance with the obligations established by anti-money laundering legislation (for this purpose, consent is not necessary as the processing of data is related to compliance with these obligations / provisions of law and / or regulation); d) ordinary marketing activities (sending e-mail, post, sms, newsletters, commercial or advertising communications, etc.). For the purposes referred to in paragraph 1, the types of data processed are substantiated in Personal Data and in particular: name and surname, date and place of birth, tax code / VAT, address of residence or location, telephone number and e-mail address, bank account details. The processing of Personal Data provided will be based on principles of correctness, lawfulness and transparency; it will be carried out in an automated and / or manual manner, in compliance with the security measures set out in Legislative Decree 101/2018 and pursuant to art. 32 of the GDPR. Please note that the processing of Personal Data will be carried out in compliance with the operations indicated in art. 4 number 2) of the GDPR; therefore the method of treatment may consist of collection, registration, organization, structuring, storage, adaptation or modification, extraction, consultation, use, communication by transmission, dissemination or any other form of provision, comparison or interconnection, limitation, cancellation or destruction . 4.- Communication of data to third parties. The Data will be processed by the Data Controller, the Data Processor and the nominees appointed pursuant to art. 29 of the GDPR. The Data may also be disclosed to companies / professional firms that provide assistance, advice, collaboration to the data controller in accounting, administrative, tax, legal, tax and financial matters, to public administrations within the limits established by law or regulation and third-party service providers to whom communication is necessary for the performance of the services covered by the contract. In any case, recourse to these subjects will take place upon the prior commitment of them to comply with the legislation on privacy. they are not subject to dissemination. 5.- Intention of the owner of personal data processing. The Data provided will be kept for a period of time not exceeding the achievement of the purposes referred to in point 1 letter a), b) and c) of this information or the termination of the contractual relationship. The Data provided for the purposes referred to in point 1 letter d) (marketing purposes) will be retained for a period of time not exceeding 2 (two) years from the termination of the contractual relationship. 7.- Compulsory or optional nature of the provision of data and consequences of a refusal to respond. The provision of data for the purposes indicated in point 1 letters a) and b) is optional; however, it is necessary for the correct and complete execution of the contract signed and any refusal in this regard will make it impossible to perform the services object of the contract. The provision of data for the purposes indicated in point 1 letter c) is mandatory as necessary for the fulfillment of regulatory obligations. The provision of data for the purposes indicated in point 1 letter d) is optional. 8.- Existence of an automated decision-making process. 9.- Rights of the interested party and methods of operation. 10.- Data Controller and Data Processor. The Owner and Manager of the treatment is LEGAL REPRESENTATIVE PRO TEMPORE of MASSERIA GRIECO S.r.l., with headquarters in OSTUNI (BR) - Contrada Grieco, P.Iva 02480530746. By subscribing to the newsletter, you authorize the processing of personal data for promotional and marketing purposes, pursuant to Article 13 of European regulation 679/2016.